Firstly and briefly, Green Home Floors is an established, dependable natural, non-toxic and bio-based flooring company. We have been in the product, design and services business for many years and we have been using and selling these types of products for many years and they are all we do. As designers and builders, our family business is based on products like zero VOC paint and flooring that are considered by the indoor air quality and green building community to be safer and healthier by limiting volatile chemcials and solvents. We carefully chose, installed and live with and maintain virtually every product we offer. For flooing, we generally do not offer bamboo, vinyl or composites for obvious off-gassing reasons, unless, and there are a few that have a compelling life cycle cost or application that no other product can offer. We only do business with companies that offer industry leading transparency and whose models are based on sustainable business practices. 1. Marmoleum is the Real Linoleum: Made from the original 150 year old recipe from Frederick Walton and made in Europe by Forbo. People find that when they go floor shopping many dealers do not even know what true linoleum even is and often try to sell vinyl as linoleum. Some online vendors list Marmoleum Linoleum on their websites as vinyl flooring and don't even sell the actual material, but use it as bait and will try to sell you something else. Marmoleum Click 3 Cinch Loc Tiles and Planks: Click Together 3/8" thick in 12" x 12" Tiles and 12" x 36" Planks. Box of 7 Tiles are 6.78 Square Feet. Boxes of 7 Planks are 20.34 Square Feet. Almost anyone who can perform simple layout, measuring and cutting with a hand or power saw can install Marmoleum Click 3 Tiles or Marmoleum Click 3 Planks. Marmoleum Modular Tile, 2.5 MM Thick, Modular Sizes: Comes in four size formats, 10"x10", 10"x20", 10"x40" and 20"x20". Many of the interesting geometric patterns are done with modular tile. Novice installers can install Marmoleum Modular Tile. Marmoleum Gluedown Tile 13"x13" MCT 2.0MM Thick: Sold only by the full carton of 45 pieces, it is 53.82 Square Feet per Box. Novice Installers can install MCT Marmoleum Composition Tile. Marmoleum Gluedown 79" Wide Roll, 2.5 MM Thick: Traditional, old-fashioned, heavy roll material. This is the material that is typically used for inlaid borders and patterns and 50 year installations. Professional installation suggested for Marmoleum Gluedown 2.5MM Sheet. Sold by the square yard, measured as 16.4" off the continuous roll. Marmoleum Gluedown MCS Sheet 2.0 MM Thick: MCS 79", or 2 meters wide, is a little thinner commercial thickness, sold by the square yard. Cut from a 105 foot roll with each 16.4" off the roll being one square yard. Professional installation suggested for MCS 2.0 MM Sheet. Sold by the square yard, measured as 16.4" off the continuous roll. Marmoleum Gluedown 79" Wide Decibel Sheet 3.2 MM: Our acoustic linoleum floors combine the unique natural characteristics of a Marmoleum floor with increased impact sound reduction of 18dB. Sold by the square yard, measured as 16.4" off the continuous roll. Forbo Furniture Linoleum 72" Wide, : A little thinner and more flexible version of flooring linoleum, it is ideal for desks, chairs, stools, cabinets, doors and displays. Sold by the square yard, measured as 18" off the 72" wide roll. Flotex Flocked Textile Tiles: Measuring 20.7" x 20.7", 12 pieces to a box covering 32.2 Square Feet, Flotex is the true healthy alternative to carpet. Flotex is crushproof, soft, waterproof and scrubbable. Simple to cut with and easy to install with a releasable adhesive, almost anyone handy with a knife and a trowel can install Flotex Tiles or Flotex Planks. Flotex Flocked Textile Sheet: Cut from a 79" wide roll, it has a factory edge that seams simply and perfectly. With all the same properties as tile, it installs just like commercial carpet but may be a little different since it does not stretch and puckers easily. Professional installation may be preferred for 79" Wide Flotex Sheet. 3. The Green Floor Designer: Please be sure to check out our planning tool that will actually show you your floor in real time. It also helps you estimate the cost and quantity of flooring that you will need. 4. Free Samples: We offer free samples for any of the Forbo flooring products we sell. We think this will keep our contractors and designers and you and your friends and family coming back to do business with us. 5. 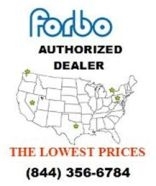 The Lowest Prices: We do offer and strive to maintain at all times, the lowest prices out there for Forbo flooring. Please let us know if you find a lower legitimate price because we want to know and will price match and beat any legitimate price where we can confirm that price. Are you a flooring contractor with a huge project on your hands? Let us know. We can help with special pricing. Just give a call to 844-356-6784. 6. Tech Support: We offer pre-sale, during-installation or post sale information you might need for your flooring products including cleaning and maintenance questions. Just reach out to us at (844) 356-6784. FYI, the person ordering and the installers ultimately are responsible for estimating, project decisions and workmanship. Have questions? Call. 7. Installer Referrals: A seasoned installer is really necessary for sheet floor. For many years we had access to a master list of flooring referrals and came to know quite a few. Many are gone or are working for facility installers today. If you are looking for a local sheet mechanic to install a fussy floor with seams, borders and inserts, you many want to give Forbo Technical a call at 800-842-7839 for a local store or an installer reference. In the NYC Metro area, we may be able to help. Most of the products we offer are beginner or novice skill set installation, except for sheet material installations that require seams. Linoleum is a different animal so please do not expect to buy the product and hand it to a "flooring installer" who may not know what it is, but is willing to try. How hard can it be? That question is linked to a lot of sad phone calls to Forbo Technical Services. 8. Straight Answers: Occasionally, we mess up, but that honestly is very seldom. We are diligent about continuous fixes and improvements to our system of sales, ordering, delivery and support. In the event we make a mistake or something goes wrong, we will give you THE STRAIGHT ANSWER ASAP. 9. Our Reputation is Our Future: We ask that if we please you, that you tell others about your experience and if we do something that can be done better that you tell us. We don't mind you giving it to us if we could have done better. 10. Your Trust: We know that the products we sell are not cheap and that your hard-earned money is on the line when you trust us to fill your order. We work hard to play by the rules and satisfy you with only new, first quality materials. 11. No Pressure: We want to give you the best price. We also do not use a call center and do not bait and switch. We are the real deal, a small family flooring team that knows their business and wants to help you with the very best prices and the very best service on the web. The Team at Green Home Floors.